Kea (Tzia) is a pretty large (131 km2 - about 2.000 inhabitants), moutainous island in the west of the Cyclades, and not far away from Athens. The main occupation of the population is agriculture. There is a medieval castle to be seen, some ancient remains and some monasteries. Most of the tourists are from Athens. This exceptionally picturesque island lies close to the south-east coast of Attica. The mountain masses, which are encountered in most of the Cyclades,are broken up by small valleys sparsely planted with vines and fruit-trees and run right down to the sea, opening out into pretty little bays. On the western side of the island is Agios Nikolaos bay, and deep within it the port of Korissia, which is considered to be one of the safest natural harbours in the Mediterranean. Ferry-boats call at Korissia -also known as Livadi - which stands on the site of the city of Korissia, which in ancient times, with Ioulis, Karthea and Poiessa, was one of the island's four independent city-states. The island's capital, Hora or Ioulida (6 km. from Korissia), has maintained its Cycladic idiom intact. Built in the shape of an amphitheatre, it presents the visitor with an impressive vista of two-storey houses and tiled roofs, steep cobbled alleyways and splendid churches with elaborately carved wooden icon screens. At the highest point of the village, on the site of the ancient acropolis, is a quarter known as Kastro which commands a breathtaking view of the nearby islands off the coast of Attica. Not far from here is the famous 'Lion of Kea' (6th century BC), hewn out of the slate. The Archaeological Museum in Hora contains interesting finds dating from the Cycladic period. The interior of the island is dotted with miniature chapels, windmills and monasteries, including that of Our Lady Kastriani, Kea's patron saint Easilly accessible from Athens, Kea offers those who are seeking a restful holiday clean, uncrowded beaches at Pisses, Korissia, Koundouros, Otzia bay and Poles bay.Here they can enjoy delicious fresh fish at picturesque little tavernas. 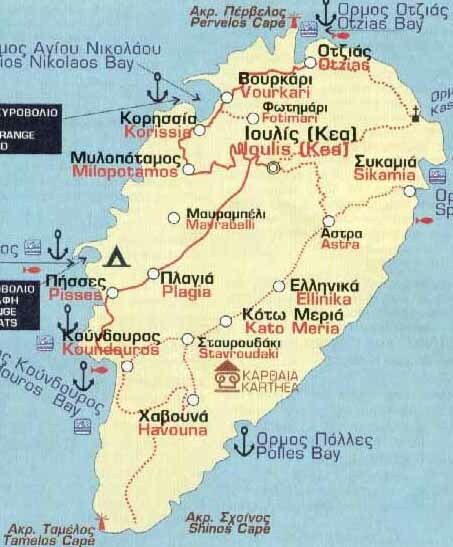 The island inherited its name by the hero Keos, who according to tradition, reached the island from Nafpactos around 1100 BC. The mythic form of the island, though, is Aristaeos, son of pll and the Numph Cyrine who saved Kea by drought. It hasn't been verified yet, who were the first inhabitants upon the island. Recent excavations prove that the prehistorically inhabitance of the island lasts until 4000 BC. Kea was inhabited by Arcades. Cares, Pelasgus, Phoenicians and Ions. En the antiquity the island was widely known for one special custom of its "TO KEION NOMIMON" according to which persons who became more than 70 years old were obliged to suicide by drinking coneion. The inhabitants of Kea took part in the Persian wars and fought in the naval battle of Salamis. Member of the Athenian alliance, the island was successively taken by the Macedonians end the Romans, which is results to the downfall of the island's civilization. During the Russian-Turk war in 1770-1774the island suffers the greatest casualties. It has been the hideout of Lampros Katsonis but also an island that was totally defenseless against the hundred pirates raids it suffered. In 1821 it participated actively to the revolution end is liberated along with the rest of the Cycladic islands. Capital of the island is Hora or loulis built in the place of the ancient homonym town at a distance of 5.5 km from the port. The Medievel castle, the lion of Kea a creation of the ancient years, a sculpture very large in size, sculpted upon schistolithic rock, There are many churches end monasteries in Tzia.